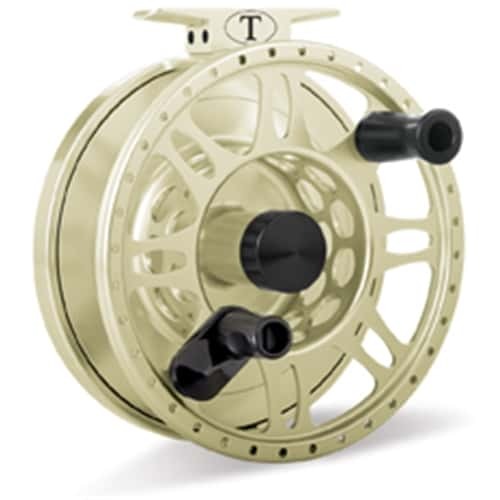 Tibor Gulfstream Fly Reels -The Tibor series of reels were first introduced in 1995 an have established themselves as the benchmark for custom-crafted fly reels. After years of development and input from the likes of Lefty Kreh and Flip Pallot, Ted was finally satisfied with a reel that truly has set a new standard in fly fishing reel technology. The spools have been updated to be ligher and will fit into older reels. Frame Size: 4 3/8 " x 1 3/4"
Spey Rod Weights: 9-10: Capacities vary by spey line type & selected backing orientation. Add a personal touch to your new Tibor, Tibor QCTM and Tibor Light® reels! In addition to our custom colors, you can take your expression of your passioin for fly fishing a step further with our exclusive engraved game fish images. Also a great way to personalize the gift of any new reel. Free personalized name plate engraving! Gamefish and custom engraving is available by special order on new reels only.